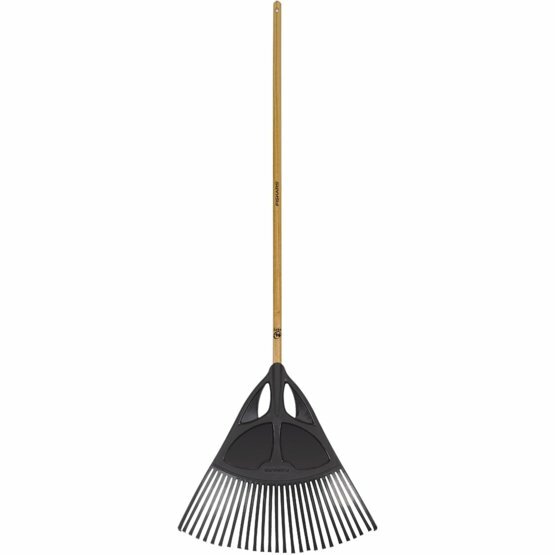 Fiskars Classic Large Leaf Rake is a beautiful, traditional tool with shaft made from lacquered ash wood. This classically designed and finished garden rake has an extra wide head spanning 65 cm and flat, rigid and curved plastic tines which prevent leaves from sliding up and blocking the head. Rounded edges make it suitable for all types of terrain when raking leaves and general yard cleaning. Clever design of the grip apertures at the top of the rake head also enable easier removal of leaf and waste matter after a hard day's work in the garden.